Favorite food: Flint river, Yogurt. 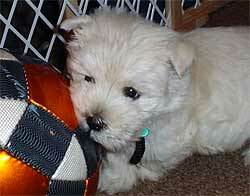 Favorite toy: Sister's Glove, Sister's soccerball. Most trouble I ever got into: Nipping mom in the face. Biggest adventure: Going to Grandma Peggy's.